Sri Lanka 44-3 (Tharanga Paranavitana 13*, Mahela Jayawardene 12, Junaid Khan 2-15) trail Pakistan 226 (Asad Shafiq 75, Misbah-Ul-Haq 40, Thisara Perera 4-63) by 182 runs. The Pakistani fast bowlers bounced back in the dying moments of the day by clinching three wickets of Sri Lanka and took back the advantage from the hosts. The first innings of Pakistan was folded back for 226 runs in 72.5 overs and Sri Lanka was struggling at 3-44 after 14.4 overs at the end of the first day’s play. The third and final Test of the series commenced on Sunday, July 8, 2012, at Pallekele International Cricket Stadium. Earlier, the captain of Sri Lanka, Mahela Jayawardene, won the toss and offered the batting to Pakistan with the intention to get few quick wickets on a turning track. Pakistan initiated the innings with Mohammad Hafeez and Taufeeq Umar as the first started off from where he left in the second Test by getting 10 runs in the second over with two fours. Hafeez added another couple of fours in the sixth over as Taufeeq kept on surviving at the other end with few close calls. The first wicket fell at 35 when Mohammad Hafeez was clean bowled by Thisara Perera for 22 runs. The Lankan Lion bowlers took over, ripped through the top order of Pakistan and the visitors were reeling at 4-56 after 16 overs. Azhar Ali and Younis Khan were unable to open their accounts as Taufeeq Umar was gone for 29 runs. Thisara Perera was the most devastating bowler after grabbing three wickets and the Pakistani batsmen found it hard to cope with his lethal bowling. The skipper Misbah-Ul-Haq and the young gun Asad Shafiq stopped the invasion of the rival bowlers with dedication. They did not take any risk and added just 26 runs by the end of the 30th over when lunch was taken. The first hundred of the innings was attained in the 38th over as Misbah accelerated the run rate with two fours in the 43rd over. The fifth wicket partnership produced 85 runs and the score was enhanced to 141 when Misbah-Ul-Haq was caught behind by the wicketkeeper Prasanna Jayawardene for 40 off 95 balls with 7 fours. Asad Shafiq was the lone fighter as Adnan Akmal provided him some assistance from the other end besides being retired hurt earlier. 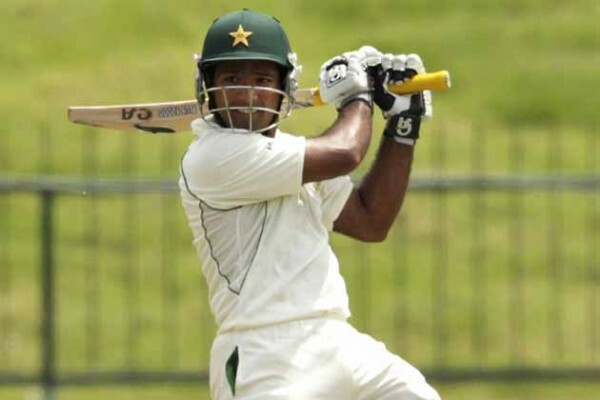 Asad Shafiq became the highest scorer with 75 off 158 deliveries with 10 fours whereas Adnan Akmal scored 24 runs. Pakistan was bowled out for 226 runs in 72.5 overs which was not a sufficient total to get hold of the match. Thisara Perera was the chief destructor by grabbing four wickets, Rangana Herath held three, Nuwan Kulasekara two and Angelo Mathews chipped in with one wicket. Sri Lanka opened the innings with the new combination of Tharanga Paranavitana and Dinesh Chandimal whereas Umar Gul and Junaid Khan started the proceedings with the new ball. 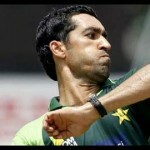 Junaid was the most dangerous of the two and both batsmen found it hard to negotiate with his lethal bowling. The batsmen were unable to score the runs freely and managed just six runs in the first six overs. The Islanders lost their first wicket at 14 when Chandimal was declared leg before wicket off Junaid Khan on the third ball of the eighth over for 8. Kumar Sangakkara came in next and survived a huge lbw appeal two balls later but was surprised to see his stumps uprooted on the last ball of the over. Mahela Jayawardene and Paranavitana put their heads down in the trying conditions and took the score to 44 before Mohammad Sami got the vital wicket of the skipper for 12 runs on the fourth ball of the 15th over. The play was called off for the day instantly and Pakistan was back in the game with the assistance of the deadly bowling from their three seamers. Pakistan will anticipate picking a couple of early wickets in the first hour of the play on day two to get full command on the match whereas Sri Lanka will bank on their middle order to bring solidarity in their innings.